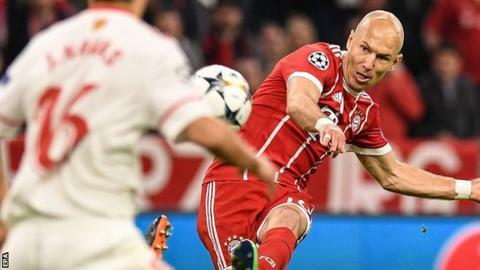 Former Netherlands forward Arjen Robben has agreed a new one-year deal at German champions Bayern Munich. The 34-year-old, who arrived from Real Madrid in 2009, has helped Bayern to seven Bundesliga titles and a Champions League triumph in 2013. Brazilian defender Rafinha, 32, has also agreed a one-year extension. "We are delighted that we will be extending these deserving players by another year," Bayern sports director Hasan Salihamidzic said. "Both Arjen Robben and Rafinha will play an important role in our plans for the upcoming season." Another Bayern veteran - 35-year-old French midfielder Franck Ribery - signed a one-year contract extension with the club last week.